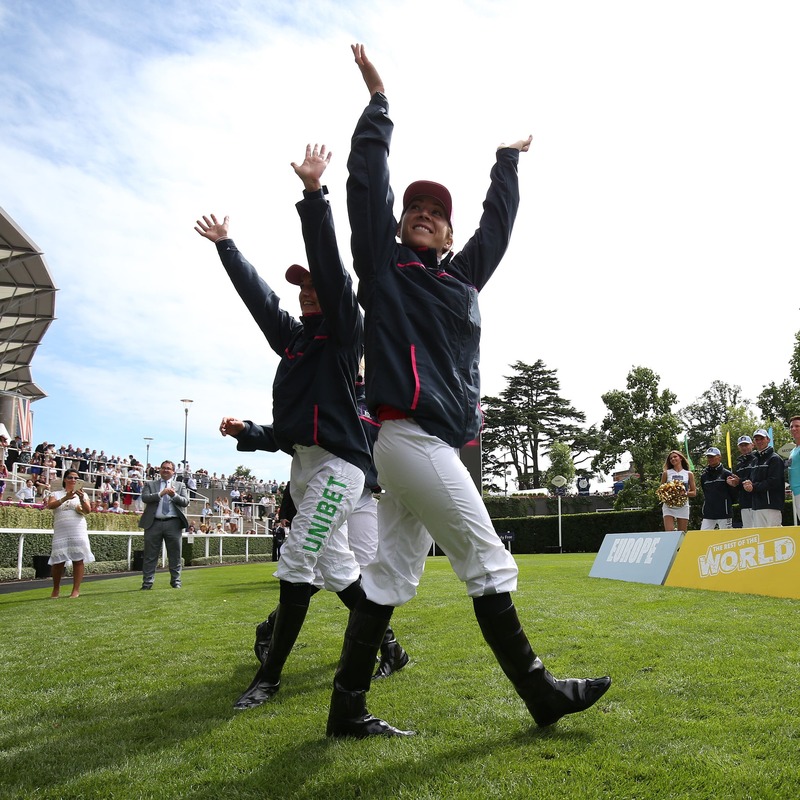 Hollie Doyle landed her first Dubai Duty Free Shergar Cup success when steering Tis Marvellous to victory in the Dash as The Girls team claimed top honours in the annual team competition at Ascot. The 21-year-old delivered the Clive Cox-trained sprinter with a well-timed challenge in the final furlong, after El Astronaute and Watchable had set the early pace. While that pair could not keep up the gallop at the business end of the five furlongs, Tis Marvellous (6-1) came with a rattling run to score by a length and a quarter from from Gracious John, with Doyle’s teammate Hayley Turner third on Line Of Reason. Doyle said: “It’s a massive deal for me to get the call-up (to ride at the Shergar Cup), let alone have a winner. “I really enjoyed this meeting last year and just got touched off in this race, so it’s great to get a win on the board. Cox said: “We did expect a big run last week (in the Stewards’ Cup), to be fair, but I think it was the extreme temperature at Goodwood. We realised that you can take a horse to water but you can’t make them drink – he didn’t take on a lot of fluids and had a drip the day before with the temperatures being so hot. “He showed an awful lot as a two-year-old, breaking the course record in the Prix Robert Papin. I think five and a half furlongs is his perfect trip, and they have gone a million miles an hour over the stiff five here. “He was fifth behind Caravaggio and Harry Angel in the Commonwealth Cup last year and is a high-class performer. He was basically in a lower-grade race here than he has been running in. Cleone (9-2) gave unheralded Per-Anders Graberg his first victory in the competition when taking the Stayers Handicap. Sweeden’s champion jockey took the lead in the final furlong on the Andrew Balding-trained gelding, but was all out to land the spoils by three-quarters of a length from Stars Of The Sea, ridden by Gerald Mosse, to give the European team a one-two. The Turner-ridden Byron Flyer was the same distance away in third. Graberg said: “It’s great to be riding here and even better to have a winner, fantastic. Kingsclere handler Balding completed a quick double when Genetics won virtually unchallenged under German rider Andreas Starke in the Shergar Cup Challenge Handicap. Coming into the race as a reserve, Genetics (9-1) stormed past long-time leader Humble Hero in the straight to win by 12 lengths. Twin Star was second with Maori Bob a further half a length back in third. Starke said: “I am very delighted to get a reserve horse like that. “I had a perfect race and he was travelling nicely. Turner got on the scoreboard with a cosy win on Via Serendipity in the Mile. Making a record 12th appearance at the meeting, Turner always had the Stuart Williams-trained four-year-old close to the pace set by Poet’s Society. Turner got first run on her rivals by kicking on a furlong out and kept Via Serendipity up to his work to get the verdict by half a length from Shady McCoy. Berkshire Blue was a third winner on the card for the Balding stable to give Hong Kong ‘magic man’ Joao Moreira victory in the Shergar Cup Classic Handicap. The well-backed 9-2 chance just held the late bid of Blue Laureate by a head with Bayshore Freeway two lengths away in third. Representing the Rest of the World, Moreira said: “I thought I had won as my horse had the momentum, but I knew it was very tight. I am very pleased. Moreira completed a double on Green Power (12-1) in the Sprint. However, Turned claimed second place on Roundhay Park to win the Silver Saddle as the top rider and help the Girls lift the team prize from Europe. Moreira showed why he is revered in the Far East as he brought the John Gallagher-trained colt to lead inside the final furlong and see off all challengers. Roundhay Park kept on stoutly to score by a neck with George Of Hearts a neck away in third. Moreira said: “It couldn’t be any better. I’m extremely happy. Turner took the Silver Saddle by one point from Moreira, 39-38, while the Girls team scored a total of 76 points, six more than Europe in second.